(Toronto,ON) June 3, 2013 –Today, new research was released demonstrating that affordable Habitat for Humanity homeownership contributes to families becoming happier and healthier, and enjoying improvements in their children’s well being and school performance. 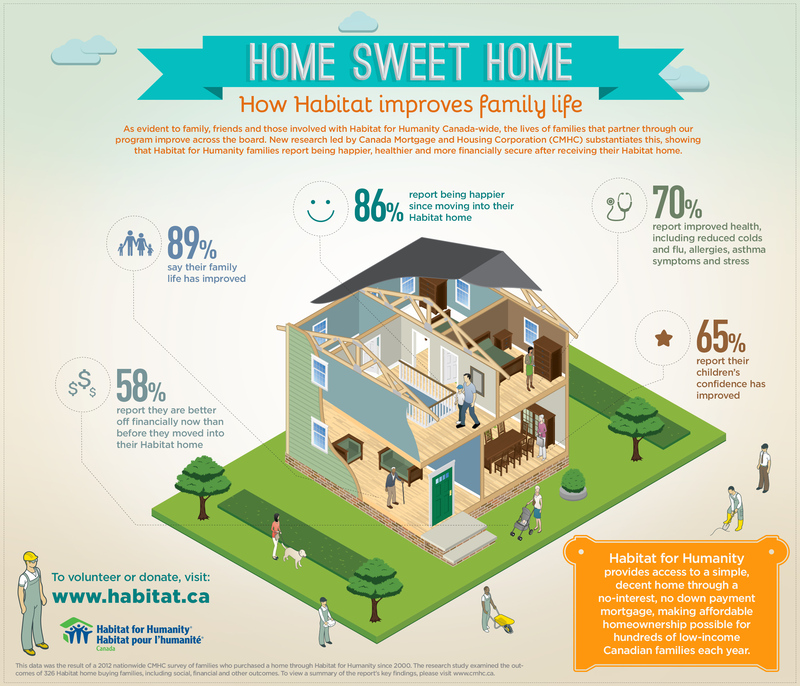 The research, led and funded by Canada Mortgage and Housing Corporation (CMHC), shows that of the families surveyed, 86 percent report being happier since moving into their Habitat home and 89 percent said their family life had improved. For this study, 326 Canadian families who have received their Habitat homes since 2000 were surveyed on changes to their health, social and financial dynamics. A leading advocate of affordable homeownership in Canada, Habitat for Humanity Canada worked with CMHC on this research to quantify the benefits and outcomes of their homeownership model on the families that partner through their program. Habitat’s model provides « a hand up, not a hand out”, with low-income families paying the full fair market value of their home through a no-interest, no down payment mortgage that is geared to their income. More than half (58 percent) reported they were better off financially now than before they moved into their Habitat home. A full copy of the report is available from CMHC here.